Developing and manufacturing a motor vehicle is a costly endeavor with uncertain paybacks. OEMs typically justify platform and powertrain business cases over a multi-year time horizon in order to meet internal rate of return (IRR) hurdle rates or level of return on invested capital (ROIC). Investment decisions are complex, and consider many inputs. However, projects are expected to meet a competitive level of return. Otherwise, investors will seek alternative investment opportunities. Capital is fluid, if the automotive industry does not provide adequate returns, money will flow to other options. Like all companies, automotive manufacturers and suppliers are resource (capital and human) constrained. Resources are allocated across many needs such as a new vehicle program versus additional assembly plant capacity to maximize the return for the total company. Recent shortening of platform and powertrain lifecycles and the introduction of higher cost technologies —driven in part by rapidly increasing regulatory scope and stringency—may be making it more difficult to recoup this fluid, competitive capital. Further, as consumer preferences become more fractionalized and volumes per nameplate and brand are driven downward, OEMs are even more challenged to deliver programs that meet the required volumes to amortize increasing costs of technology investments to meet emissions, fuel economy and safety requirements. When volumes decline and technology costs rise, profit margins will shrink because of fewer vehicles over which to amortize technology investment costs. Such an outcome would further drive capital away from the industry at a time when substantial investments are needed for continued innovation. Manufacturers largely moved to global platform-based production processes beginning in the 1980s. Since that time, various pressures, such as increased global competition, regulatory changes, and the rapid advancement of technology, have contributed to a shortening of vehicle platform lifecycles. For light vehicles, platforms introduced during the 1980s lasted 8.6 years before the introduction of a new platform generation or retirement. The shift towards light trucks, which traditionally have had longer average platform cycles, temporarily buoyed overall platform longevity, but declines were still realized, with platforms entering production during the 1990s and 2000s existing for an average of 7.6 years. During the current decade, the market has shifted again, many passenger cars and some truck-based SUVs have been replaced by car-based CUVs. This move back to car-based products along with the need to rapidly implement new technologies and competitively refresh the vehicles as new competition hits the market is leading to a pronounced drop in platform longevity for both cars and trucks, to an overall average of 6.7 years (a 22% faster development cycle than light vehicles in the 1980s). According to Merrill Lynch (The US Automotive Product Pipeline, May 2017) between 2018 and 2021, the US industry will introduce new vehicles every year equivalent to 21 percent of the industry’s total volume. This compares to an annual “turnover” rate of 16 percent between 1998 and 2017. As such, this will reduce the average product age of a vehicle sold on the market to 2.7 years from a historic 3 years between 1998 and 2017. Basically, the industry is expected to recover its investment in 10 percent less time (and likely, over fewer units in a highly fractionalized marketplace). Development of vehicle platforms is quite expensive, requiring a minimum sales threshold be achieved before engineering and equipment costs are recouped. This is a prime driver for minimizing the number platforms in an OEM’s portfolio, and emphasizing global platforms to be able to produce the most number of units off common platforms and component sets. Further tightening of development cycles – which will reduce the number of units off a platform –poses challenges to the industry. Pushing more product development activity through the process than it has been designed for presents the challenges of not having enough resources such as test facilities and engineering talent. OEMs historically have built powertrain business cases over at least a ten-year time horizon, straddling two or more vehicle programs. This time horizon is driven by the need to introduce new technology, but constrained by the large levels of invested capital in the design, engineering, testing and validation of engine and transmission programs as well as the capital investment required for the machining and assembly lines for drivetrain components and assemblies. Vehicle programs, in turn, take on the cost of these powertrain programs as they are allocated over the total unit volumes incorporated into the vehicle platform business cases. OEMs, rationally, design and engineer engine and transmission families to be used across as many vehicle platforms and nameplates to allocate the powertrain costs and market risks across as many units, market segments and vehicle designs as possible. OEMs that have a variety of powertrain options per platform or nameplate increase the probability that the vehicles will be in demand month-to-month, quarter-to-quarter and year-to-year through fuel price changes, competitor new vehicle introductions, regulation requirements, consumer lending affordability and other market volatility. One of the greatest risks an OEM faces for any investment, but particularly for powertrain investment since it is so large and specialized, is having an investment become stranded. That is, if a specific nameplate or vehicle platform fails in the market place or needs to be replaced before its planned life cycle, any engine or transmission program and plant investment that is tied to such a platform is at risk of needing to be absorbed by other vehicle programs or be “stranded” and written off as a loss. Driven by the need to introduce technology faster, the product development process is shortened resulting in higher development costs and increasing stranded capital. This is exacerbated as the OEMs at the same time are satisfying market forces with an increasing cadence of vehicle introductions and regulations forcing rapid powertrain technology change. This is particularly true as more product introductions and refreshes occur on the light-truck side of the market. This may shorten powertrain family and individual component product life cycles and the unit volumes available to allocate engineering, design and tooling along with manufacturing plant investment costs in a cost effective, per-unit manner. CAR research indicates OEM and suppliers may need to raise the piece-cost estimate by anywhere from $10s to $100s of dollars to recover possible lost volume based on more frequent technology changes. 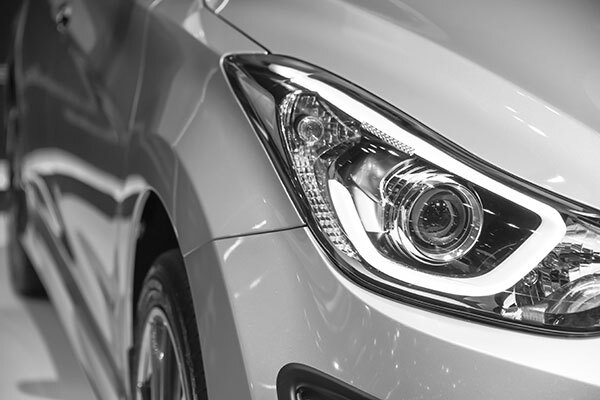 The result may be to force consumer costs higher as OEMs and suppliers need to plan for powertrain payback periods to match vehicle platform longevity as short as 5- to 10-years—or reduce profitability. Figure 1 is a stylized representation of more frequent implementation of technology. 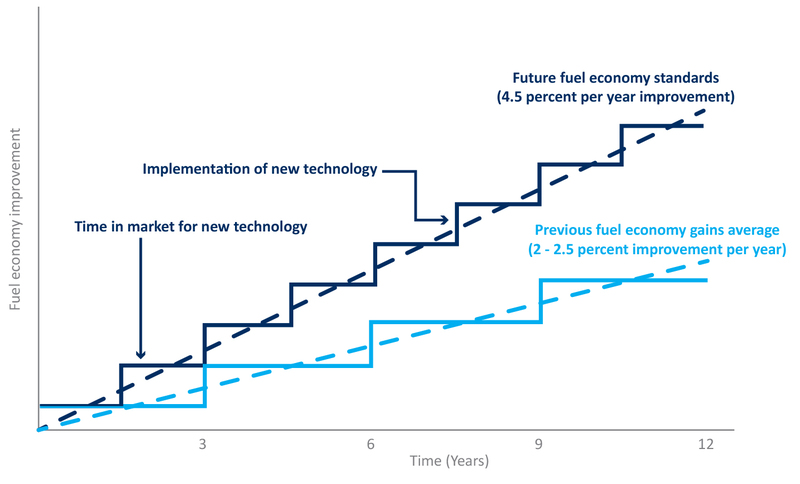 In this example, the shortening the product lifecycle from 3 years to 1.5 years is driven by the need to meet an increased stringency in fuel economy regulation. The light blue line represents a 2-2.5 percent historical annual increase in fuel economy. The darker line represents a shift to a more stringent standard (4.5 percent), and a concomitant shortening of the useful life span for fuel efficiency technologies. As illustrated, companies will need to introduce more technologies, and at a more rapid rate. The number and frequency of technology steps is drastically increased. This has many implications, including reduced time to regain investment, increased stranded capital, less time to validate technology, and the need for increased engineering resources. Figure 1: Illustration of shift in fuel economy standards and accelerated cycle of 1.5 years (darker) to accommodate new fuel economy technologies. While this “time compression” can be driven by competitive forces (i.e., pull by consumers for new technology, change in energy prices, or shifting consumer interests), it can also be brought on by rapidly more stringent emissions, fuel efficiency and safety regulation. It is likely that, due to the opportunity for higher prices received from a consumer demanded technology, responding to a competitive shift may incur less total loss (stranded capital plus new product development cost) than responding to a regulatory shift. Such a regulatory shift may offer broad and important social benefits, but less perceived direct value to individual consumers—thus little incentive for the consumer to pay more for the technology and, less chance to recoup the losses. This points to the need for transparency and sensitivity to timing for major technology changes. As the rate of introducing new technology increases with shorter product development cycles, the sensitivity to timing becomes critical. Regulatory flexibility is needed so that the interaction of technology development, validation and production can be attained in an efficient manner. It is critical that, in this highly uncertain time of technology change, the industry is able to maintain an effective product development cadence that enables new technology, but does not force undue harm on their financial position. Such discipline would allow the cost allocation to the vehicle platform be as effective as possible, consumer prices to remain in check, and facilitates the current reduction in the average vehicle platform longevity trend. The auto industry is at a crossroad as it tries to improve its investment attractiveness to fuel increasing human, financial and physical capital investment needs to bring an unprecedented level of new technology to market while at the same time competitive forces and regulatory requirements challenge the basis of the industry’s major competitive covenant: economies of scale. What is clear is that as product cycles compress for vehicle platform and powertrain, the risks for OEMs are greater than ever before. While regulations to meet 2025 fuel economy and greenhouse gas targets increase, automakers face pressures of less time to make significant product changes, less opportunity for technology learning, and less time to amortize their costs. Further, pushing product development activity faster and at higher volume stresses the systems and resources, in particular engineering expertise, and adds costs not fully anticipated or accounted for by the regulators. With additional analysis and communication for and by the industry, investment community and public policy makers, the risks and costs of this cross road may be minimized and properly accounted for. This includes benchmarking product development best practices to reduce time and effort of commercializing new technologies; refining future investment ROI calculations, costs and volumes; and incorporating more comprehensive capital investment input into public policy cost/benefit analysis.